You can find some of the possible applications for QR codes here. The QR code. Developed in Japan for the purposes of automotive logistics, today it sustainably changes the Internet. The QR code consists of a rigid square matrix. This matrix consists of the target information. 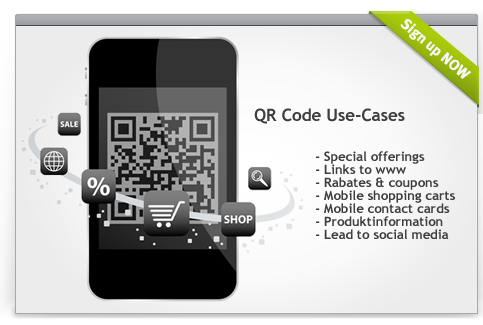 A QR Reader provides you with the possibility to use QR codes. The aim determines the quality of a QR campaign. Here you can see some exciting campaigns of leading companies using QR codes to facilitate customer loyalty and customer acquisition. Be one step ahead of your competitors. With our products and services you will get the best out of your campaigns. Register right now! We have arranged special conditions for start-ups and young companies. We would like you to lay the foundation stone for a successful future from the very beginning. Click here to find out more! QR codes constantly change the digital and analog world: they create a simple and quick link between the Internet and the real world. Be there and benefit from the growing market. So that you could test the benefits of our services without any risk and long contract periods, we have special offers for you. More information can be found here.